The PS Waverley lying in Brodick Bay in front of Brodick Castle. Paddle steamers like this were formerly extremely common on the Clyde. The Islands of the Firth of Clyde are the fifth largest of the major Scottish island groups after the Inner and Outer Hebrides, Orkney and Shetland. They are situated in the Firth of Clyde between Ayrshire and Argyll and Bute. There are about forty islands and skerries, of which only four are inhabited and only nine larger than 40 hectares (99 acres). [Note 1] The largest and most populous are Arran and Bute, and Great Cumbrae and Holy Isle are also served by dedicated ferry routes. Unlike the four larger Scottish archipelagos, none of the isles in this group are connected to one another or to the mainland by bridges. The geology and geomorphology of the area is complex and the islands and the surrounding sea lochs each have distinctive features. The influence of the Atlantic Ocean and the North Atlantic Drift create a mild, damp oceanic climate. The larger islands have been continuously inhabited since Neolithic times, were influenced by the emergence of the kingdom of Dál Riata from 500 AD and then absorbed into the emerging Kingdom of Alba under Kenneth MacAlpin. They experienced Viking incursions during the Early Middle Ages and then became part of the Kingdom of Scotland in the 13th century. There is a diversity of wildlife, including three species of rare endemic tree. The Highland Boundary Fault runs past Bute and through the northern part of Arran, so from a geological perspective some of the islands are in the Highlands and some in the Central Lowlands. As a result, Arran is sometimes referred to as "Scotland in miniature" and the island is a popular destination for geologists, who come to see intrusive igneous landforms such as sills and dykes as well as sedimentary and metasedimentary rocks ranging widely in age. Visiting in 1787, the geologist James Hutton found his first example of an unconformity there and this spot is one of the most famous places in the study of geology. A group of weakly metamorphosed rocks that form the Highland Border Complex lie discontinuously along the Highland Boundary Fault. One of the most prominent exposures is along Loch Fad on Bute. Ailsa Craig, which lies some 25 kilometres (16 mi) south of Arran, has been quarried for a rare type of micro-granite containing riebeckite known as "Ailsite" which is used by Kays of Scotland to make curling stones. As of 2004, 60 to 70% of all curling stones in use were made from granite from the island. In common with the rest of Scotland the Firth of Clyde was covered by ice sheets during the Pleistocene ice ages and the landscape is much affected by glaciation. Arran's highest peaks may have been nunataks at this time. After the last retreat of the ice sea level changes and the isostatic rise of land makes charting post glacial coastlines a complex task but the resultant clifflines behind raised beaches are a prominent feature of the entire coastline. The soils of the islands reflect the diverse geology. Bute has the most productive land, and a pattern of deposits that is typical of the southwest of Scotland. There is a mixture of boulder clay and other glacial deposits in the eroded valleys, and raised beach and marine deposits elsewhere, especially to the south and west which result in a machair landscape in places, inland from the sandy bays, such as Stravanan. The Firth of Clyde, in which these island lie, is north of the Irish Sea and has numerous branching inlets, some of them substantial features in their own right. These include Loch Goil, Loch Long, Gare Loch, Loch Fyne and the estuary of the River Clyde. In places the effect of glaciation on the seabed is pronounced. For example, the Firth is 320 metres (1,050 ft) deep between Arran and Bute, although they are only 8 kilometres (5.0 mi) apart. The islands are all exposed to wind and tide and various lighthouses, such as those on Ailsa Craig, Pladda and Davaar act as an aid to navigation. The Firth of Clyde lies between 55 and 56 degrees north, at the same latitude as Labrador in Canada and north of the Aleutian Islands, but the influence of the North Atlantic Drift—the northern extension of the Gulf Stream—ameliorates the winter weather and the area enjoys a mild, damp oceanic climate. Temperatures are generally cool, averaging about 6 °C (43 °F) in January and 14 °C (57 °F) in July at sea level. Snow seldom lies at sea level and frosts are generally less frequent than the mainland. In common with most islands of the west coast of Scotland, rainfall is generally high at between 1,300 mm (51 in) per annum on Bute, the Cumbraes and in the south of Arran and 1,900 mm (75 in) per annum in the north of Arran. The Arran mountains are wetter still with the summits receiving over 2,550 mm (100 in) annually. May, June and July are the sunniest months, with upwards of 200 hours of bright sunshine being recorded on average, southern Bute benefiting from a particularly high level of sunny days. Mesolithic humans arrived in the Firth of the Clyde during the fourth millennium BC, probably from Ireland. This was followed by a wave of Neolithic peoples using the same route and there is some evidence that the Firth of Clyde was a significant route via which mainland Scotland was colonised at this time. A particular style of megalithic structure developed in Argyll, the Clyde estuary and elsewhere in western Scotland that has become known as the Clyde cairn. They are rectangular or trapezoidal in shape with a small enclosing chamber faced with large slabs of stone set on end and sometimes subdivided into smaller compartments. A forecourt area may have been used for displays or rituals associated with the interment of the dead, who were placed inside the chambers. They are concentrated in Arran, Bute and Kintyre and it is likely that the Clyde cairns were the earliest forms of Neolithic monument constructed by incoming settlers although few of the 100 or so examples have been given a radiocarbon dating. An example at Monamore on Arran has been dated to 3160 BC, although it was almost certainly built earlier than that, possibly c. 4000BC. There are also numerous standing stones dating from prehistoric times, including six stone circles on Machrie Moor, Arran and other examples on Great Cumbrae and Bute. Bronze Age settlers also constructed megaliths at various sites, many of them dating from the second millennium BC, although the chambered cairns were replaced by burial cists, found on for example, Inchmarnock. Settlement evidence, especially from the early part of this era is however poor. The Queen of the Inch necklace is an article of jewellery made of jet found on Bute that dates from circa 2000 BC. During the early Iron Age Brythonic culture held sway, there being no evidence that the Roman occupation of southern Scotland extended to these islands. During the 2nd century AD Irish influence was at work in the region and by the 6th century the kingdom of Dál Riata was established. Unlike the P-Celtic speaking Brythons, these Gaels spoke a form of Gaelic that still survives in the Hebrides. Through the efforts of Saint Ninian and others Christianity slowly supplanted Druidism. Dál Riata flourished from the time of Fergus Mór in the late fifth century until the Viking incursions that commenced in the late eighth century. Islands close to the shores of modern Ayrshire would have remained part of the Kingdom of Strathclyde during this period, whilst the main islands became part of the emerging Kingdom of Alba founded by Kenneth MacAlpin (Cináed mac Ailpín). The Islands of the Clyde historically formed the border zone between the Norse Suðreyjar and Scotland. As such many of these islands fell under Norse hegemony between the 9th and 13th centuries. The islands of the Clyde may well have formed the power base of Somhairle mac Giolla Brighde and his descendants by the last half of the 12th century. At about this time period, the authority of the Steward of Scotland seems to have encroached into the region; and there is reason to suspect that, by the turn of the 13th century, the islands were consumed by the expanding Stewart lordship. The western extension of Scottish authority appears to have been one of the factors behind a Norwegian invasion of the region in 1230, in which the invaders seized Rothesay Castle. In 1263 Norwegian troops commanded by Haakon Haakonarson repeated the feat but the ensuing Battle of Largs between Scots and Norwegian forces, which took place on the shores of the Firth of Clyde, was inconclusive as a military contest. This marked an ultimately terminal weakening of Norwegian power in Scotland. Haakon retreated to Orkney, where he died in December 1263, entertained on his death bed by recitations of the sagas. Following this ill-fated expedition, all rights that the Norwegian Crown "had of old therein" in relation to the islands were yielded to the Kingdom of Scotland as a result of the 1266 Treaty of Perth. From the mid-thirteenth century to the present day all of the islands of the Clyde have remained part of Scotland. From the commencement of the early medieval period until 1387 all of these isles were part of the Diocese of Sodor and Man, based at Peel, on the Isle of Man. Thereafter, the seat of the Bishopric of the Isles was relocated to the north, firstly to Snizort on Skye and then Iona, a state of affairs which continued until the 16th century Scottish Reformation. The century following 1750 was time of significant change. New forms of transport, industry and agriculture brought sweeping changes, and an end to traditional ways of life that had endured for centuries. The aftermath of the Battle of Culloden marked the beginning of the end for the clan system and whilst there were marked improvements in living standards for some, these transformations came at a cost for others. In the early 19th century Alexander, 10th Duke of Hamilton (1767–1852) embarked on a programme of clearances that had a devastating effect on Arran's population. Whole villages were removed and the Gaelic culture of the island dealt a terminal blow. A memorial to this early form of ethnic cleansing has been constructed on the shore at Lamlash, paid for by a Canadian descendant of the emigrants. From the 1850s to the late 20th century the Clyde Puffer, made famous by the Vital Spark, was the workhorse of the islands, carrying all kinds of produce and products to and from the islands. The Caledonian Steam Packet Company (CSP) was formed in May 1889 to operate steamer services to and from Gourock for the Caledonian Railway and soon expanded by taking over rival steamer operators. David MacBrayne Ltd operated the Glasgow to Ardrishaig steamer service, as part of the "Royal Route" to Oban. During the 20th century many of the islands were developed as tourist resorts for Glaswegians who went "Doon the Watter", in parallel to mainland resorts such as Largs and Troon. In 1973 CSP and MacBraynes commenced joint Clyde and West Highland operations under the new name of Caledonian MacBrayne. A publicly owned company, they serve Great Cumbrae, Arran and Bute as well as running mainland-to-mainland ferries across the firth. Private companies operate services from Arran to Holy Isle and from McInroy's Point (Gourock) to Hunter's Quay on the Cowal peninsula. 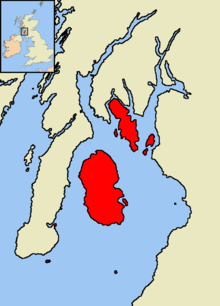 The majority of the islands at one time made up the traditional County of Bute. Today the islands are split more or less equally between the modern unitary authorities of Argyll and Bute and North Ayrshire with only Ailsa Craig and Lady Isle in South Ayrshire falling outwith these two council areas. The following table gives a list of the islands of the Firth of Clyde with an area greater than 40 hectares (approximately 100 acres) plus adjacent smaller uninhabited islets, tidal islets only separated at higher stages of the tide, and skerries which are only exposed at lower stages of the tide. Six islands were inhabited in 2001 including Davaar and Sanda with 2 and 1 residents respectively. By the time of the 2011 census neither had a usually resident population. The Byron Darnton tavern and holiday cottages on Sanda. The inn is named after a 1946 shipwreck on the island. Some islets lie remote from the larger islands and are listed separately here by location. Gare Loch is a small loch which hosts the Faslane Naval Base, the home of the UK's Trident nuclear submarines. At its southern end, the loch opens into the Firth of Clyde, via the Rhu narrows. It contains two islets: Green Island and Perch Rock. Loch Fyne, which extends 65 kilometres (40 mi) inland from the Sound of Bute is the longest of Scotland's sea lochs and contains several islets and skerries. These are Duncuan Island, Eilean Ardgaddan, Eilean a' Bhuic, Eilean Aoghainn, Eilean a' Chomhraig, Eilean an Dúnain, Eilean Buidhe (Ardmarnock), Eilean Buidhe (Portavadie), Eilean Fraoch, Eilean Math-ghamhna, Eilean Mór, Glas Eilean, Heather Island, Inverneil Island, Kilbride Island and Liath Eilean. The North Ayrshire islets of Broad Rock, East Islet, Halftide Rock, High Rock and North Islet are all found surrounding Horse Isle. Lady Isle, which lies off the South Ayrshire coast near Troon once housed "ane old chapell with an excellent spring of water". However, in June 1821 someone set fire to the "turf and pasture", and permanently destroyed the island's grazing, with gales blowing much of the island's soil into the sea. Neither Loch Goil nor Loch Long, which are fjord-like arms of the firth to the north, contain islands. The following are places along that shores of the Firth of Clyde that are not islands and have misleading names, eilean being Gaelic for "island": Eilean na Beithe, Portavadie; Eilean Beag, Cove; Eilean Dubh, Dalchenna, Loch Fyne; Eilean nan Gabhar, Melldalloch, Kyles of Bute; Barmore Island, just north of Tarbert, Kintyre; Eilean Aoidh, south of Portavadie; Eilean Leathan, Kilbrannan Sound just south of Torrisdale Bay; Island Muller, Kilbrannan Sound north of Campbeltown. There are populations of red deer, red squirrel, badger, otter, adder and common lizard. Offshore there are harbour porpoises, basking sharks and various species of dolphin. Davaar is home to a population of wild goats. Over 200 species of bird have been recorded in the area including black guillemot, eider, peregrine falcon and the golden eagle. In 1981 there were 28 ptarmigan on Arran, but in 2009 it was reported that extensive surveys had been unable to record any. Similarly, the red-billed chough no longer breeds on the island. Arran also has three rare endemic species of tree, the Arran Whitebeams. These are the Scottish or Arran whitebeam, the cut-leaved whitebeam and the Catacol whitebeam, which are amongst the most endangered tree species in the world. They are found in a protected national nature reserve, and are monitored by staff from Scottish Natural Heritage. Only 283 Arran whitebeam and 236 cut-leaved whitebeam were recorded as mature trees in 1980. The Catacol whitebeam was discovered in 2007 and steps have been taken to protect the two known specimens. Bute Bót (see above) Norse or Gaelic Possibly "fire isle" Eilean Bhòid or Bód Possibly from Brythonic budh for "corn" and previously known as Rothesay meaning "Roderick's island"
Great Cumbrae Cymri English/Brythonic place of the Brythonic people Cumaradh Mòr Gaelic literally means "place of the Cymric people". Previously known in English as Great or Greater Cumray. Holy Isle - English Refers to Molaise of Leighlin Eilean Mo Laise Previously known as "Lamlash", the English name was adopted in 1830 when the Arran village took this name. In Gaelic, the island is also known as "An t-Eilean Àrd" (the high island). Sanda Sandtange or Havin Old Norse or Danish sandspit or anchorage Àbhainn Also known as "Sanda Island"
^ The definition of an island used is that it is land that is surrounded by seawater on a daily basis, but not necessarily at all stages of the tide, excluding human devices such as bridges and causeways. Various other definitions are used in the Scottish context. For example, the General Register Office for Scotland define an island as "a mass of land surrounded by water, separate from the Scottish mainland" but although they include islands linked by bridges etc., this is not clear from this definition. Haswell-Smith (2004) uses "an Island is a piece of land or group of pieces of land which is entirely surrounded by water at Lowest Astronomical Tide and to which there is no permanent means of dry access". This consciously excludes bridged islands, which most other sources include. ^ This tale is related in the Norse sagas, but the context is confused. They assert that the arrangement was made with King Malcolm, but in fact it was Edgar who was King of Scots at the time. ^ In support of the controversial Vasconic substratum hypothesis, Theo Vennemann notes the recurrence of the element aran, (Unified Basque haran) meaning"valley", in names like Val d'Aran, Arundel, or Arendal. ^ "Waverley" Archived 8 July 2011 at the Wayback Machine. Clyde Waterfront Heritage. Retrieved 5 September 2010. ^ General Register Office for Scotland (2003) "Appendix". ^ a b "Destinations". Caledonian MacBrayne. Retrieved 22 Jan 2011. ^ a b "Getting Here". The Holy Isle Project. Retrieved 12 May 2012. ^ Montgomery, Keith (2003). "Siccar Point and Teaching the History of Geology" (PDF). University of Wisconsin. Retrieved 26 March 2008. ^ "Hutton's Unconformity - Lochranza, Isle of Arran, UK - Places of Geologic Significance on Waymarking.com". Waymarking.com. Retrieved 20 October 2008. ^ McKirdy et al. (2007) pp. 297- 301. ^ McKirdy et al. (2007) p. 28. ^ "Bute's Geology & Geomorphology" Bute-gateway.org. Retrieved 20 Jan 2011. ^ "Bute Map 6: Garroch Head to Stravannan Bay" (pdf) scapetrust.org. Retrieved 20 Jan 2011. ^ a b "Regional mapped climate averages" Met Office. Retrieved 4 September 2009. ^ Morris, John H. "Sailing through Scottish Antiquities" scottish.antiquities.ukonline.co.uk. Retrieved 4 February 2011. ^ "Arran, Monamore, Meallach's Grave" Scotland's Places.Retrieved 4 February 2011. ^ "Great Cumbrae Island, Craigengour" Scotland's Places.Retrieved 4 February 2011. ^ "The Queen of the Inch Necklace and Facial reconstruction" Archived 19 June 2010 at the Wayback Machine. Bute Museum. Retrieved 5 September 2010. ^ Forte; Oram; Pedersen (2005) pp. 241-248. ^ Forte; Oram; Pedersen (2005) pp. 248-253. ^ "Agreement between Magnus IV and Alexander III, 1266" isleofman.com. Manx Society vols IV, VII & IX. Retrieved 11 Jan 2011. ^ Mackillop, Dugald "The History of the Highland Clearances: Buteshire - Arran" electricscotland.com. Retrieved 18 July 2009. ^ "Lagantuine - Isle of Arran, Ayrshire UK" waymarking.com. Retrieved 18 July 2009. ^ "Lamlash" Ayrshireroots.com. Retrieved 20 Jan 2011. ^ "Caledonian Steam Packet Company". Scran - part of the Royal Commission on the Ancient and Historical Monuments of Scotland. Retrieved 30 January 2011. ^ "PS Columba". Paddle Steamer Resources by Tramscape. Archived from the original on 7 July 2011. Retrieved 30 January 2011. ^ "The Puffer" Archived 22 July 2012 at the Wayback Machine. Inveraray Maritime Heritage Museum. Retrieved 4 September 2010. ^ "History of Caledonian MacBrayne". West Highland Steamer Club. Archived from the original on 30 January 2010. Retrieved 30 January 2011. ^ "Summer Timetables". Caledonian MacBrayne. Retrieved 5 Feb 2011. ^ "Western Ferries". Retrieved 6 February 2001. ^ a b General Register Office for Scotland (28 November 2003) Scotland's Census 2001 – Occasional Paper No 10: Statistics for Inhabited Islands. Retrieved 26 February 2012. .
^ a b c Mac an Tàilleir (2003) various pages. ^ Haswell-Smith (2004) unless otherwise indicated. ^ a b c Ordnance Survey maps. ^ All as identified by Ordnance Survey maps. ^ "Gare Loch". Gazetteer for Scotland. Retrieved 29 August 2010. ^ "West Loch Tarbert" Gazetteer for Scotland. Retrieved 13 September 2008. ^ "Tarbert History" Archived 20 December 2008 at the Wayback Machine Tarbert.info. Retrieved 13 September 2008. ^ "Gateway to Scotland" University of Edinburgh. Retrieved 29 August 2010. ^ "History of Lady Isle" ladyisle.com. Quoting Geographical Collections relating to Scotland. Vol.1, pages 412/3. Retrieved 14 October 2007. ^ "Memories of Old Troon". www.ladyisle.com. Retrieved 29 August 2010. ^ Barmore Island Gazetteer for Scotland Retrieved 1 December 2007. ^ Ordnance Survey maps unless otherwise stated. ^ a b "Natural History". Arran Natural History Society. Retrieved 12 May 2012. ^ "About Kildalloig Estate and Davaar Island". kintyrecottages.com. Retrieved 4 September 2010. ^ "Iconic Birds at Risk" (1 Feb 2009) Glasgow. Sunday Herald. ^ "A6.102a Chough Pyrrhocorax pyrrhocorax (breeding)" (pdf) JNCC. Retrieved 1 August 2009. ^ Johnston, Ian (15 June 2007) "Trees on Arran 'are a whole new species' " Edinburgh. The Scotsman. Retrieved 18 June 2007. ^ Bignal, Eric (1980). "The endemic whitebeams of North Arran". The Glasgow Naturalist. 20 (1): 60–64. ^ "New species of tree discovered " (14 June 2007) BBC. Retrieved 18 Jan 2011. Gillen, Con (2003) Geology and landscapes of Scotland. Harpenden. Terra. Hollander, Lee M (ed. & tr.) (1964) Heimskringla: History of the Kings of Norway. Austin. University of Texas Press. McDonald, Dan (1977) The Clyde Puffer. Newton Abbot. David & Charles. Murray, W.H (1973) The Islands of Western Scotland. London. Eyre Methuen. Ordnance Survey (2009) "Get-a-map". Retrieved 1–31 August 2010. Watson, W. J (1994) The Celtic Place-Names of Scotland. Edinburgh. Birlinn. ISBN 1-84158-323-5. First published 1926.